Last updated by +CubozoaRu at 25.09.2018 . What’s the story with Rory? 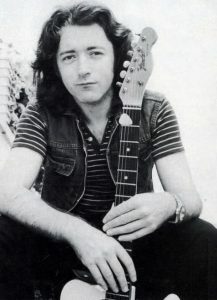 As the very lifelike statue of Ballyshannon’s favourite son, Rory Gallagher is about to be installed on the Diamond in Ballyshannon one Ballyshannon man gives his own personal insight into the man who has become a musical legend world wide. Cllr. Barry O’Neill has been a Gallagher fan all his life and is currently the Chairperson of the Rory Gallagher Festival held in the Town every year. Запись опубликована 02.01.2017 автором +CubozoaRu в рубрике Блог Дмитрия, Истории с метками Rory Gallagher, гитаристы, Гэлэхер, Рори, Уильям Рори Галлахер.